One year ago today, Hooked went live with this post. Astute readers may notice that that first post’s date doesn’t match today’s celebration. Though I wrote and posted “The Launch” on March 10, 2011, I didn’t have the courage to make it public until 8 days later. Full of trepidation, I wasn’t sure what I had to say – or if anyone would care. Arriving late to the blogosphere (about 3 years after my dad prodded, “Do you have a blog yet?”), I agonized over what kind of first impression Hooked would make. Just as my perspective is unique, so is yours. As you introduced yourselves in the comments, strangers became new friends, and I delighted in your diverse voices. Encouraging family members. Current and retired fishermen. Women from an astounding variety of life experiences. Whether actively working on the water, land-locked and dreaming of a life adrift, or seasick-prone and happily rooted ashore, you tugged the threads of these posts and found them connected to the fabric of your own lives. So this post isn’t about celebrating 12 months of a one-dimensional online construct. This is about recognizing and honoring community, and that’s all of you who take the time to stop by and say hello. You’ve become participants in these stories. Your hearts seized as whales rose up beneath the Nerka. (Maybe some expletives fell from your lips, too, in chorus with those falling from mine.) You celebrated Cap’n J’s birthday, and you imagined the taste of traditional Tlingit foods. When I shared my writer’s panic last fall, you offered support and encouragement. You learned the interdependent relationship between salmon, trees, and Southeast Alaskans, and you rallied as spokespeople for the Tongass National Forest. You cheered for the 2012 Fisher Poets, and you grieved those lost at sea. Hooked’s readers have been the greatest joy of this experience. I wish I could offer you a slice of that aquatic-themed cake (or provide a gluten-free/sugar-free/vegan alternative) in thanks. You’ll just have to trust that we enjoyed it with you in mind. Bear, too. In lieu of cake, I do have a gift for one of you. 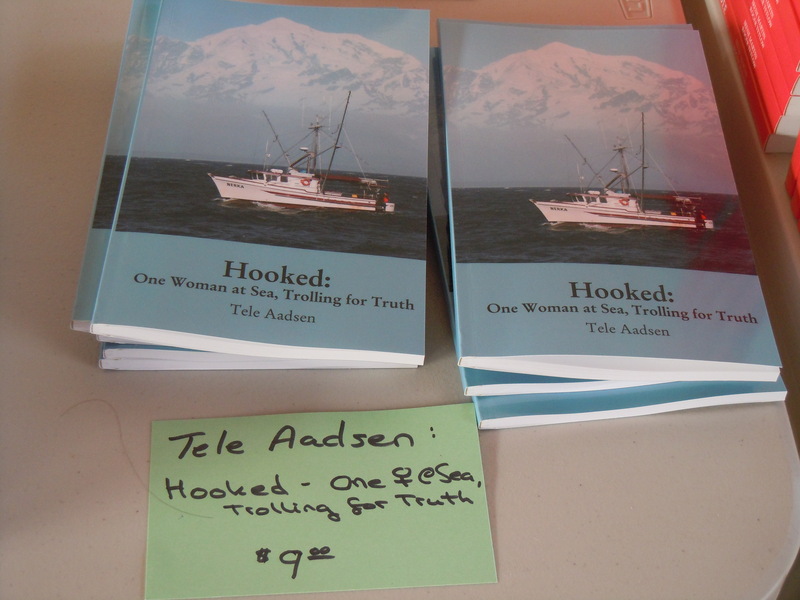 Two months ago, I printed a few copies of Hooked: The Best of 2011 through blurb.com. An 80 page collection of my favorite posts, they came out pretty nicely (only 2 typos discovered thus far, and purely my fault.) If you’d like to be entered into a drawing to win your own copy, leave a comment here before midnight on Wednesday, and I’ll put your name in a hat. (No, not a hat, but an Xtra Tuf boot. Thanks for the suggestion, Cedar – cultural authenticy matters!) Cap’n J will do the honors on the morning of the 22nd, and I’ll stick the winner’s copy in the mail as one of my final tasks before we head north. Are you a long-time Hooked reader, or a new visitor? As we approach the upcoming fishing season, are there particular stories or issues you’d like to hear about? What have you liked in your time with Hooked, and what could we do differently over our second year? Thanks, Spencer! Looking forward to crossing paths with you and Ellen this season. I love being part of such a wonderfully diverse community. And most of all I love reading your writing Tele. Keep it up. Steffany, I’m so glad to have met you this fall/winter. Likewise, keep YOUR writing up – I loved your last piece, and am going to miss following your stories. Happy Birthday, Hooked! And congratulations, Tele, on all that you’ve achieved in the past year. Here’s to many more! Cheers to that! Thanks for making my writing stronger this winter, as well as much more fun. Tele! Congratulations on a fabulous year! I love reading your stuff, dear. Keep it coming. Thank you, friend! Definitely helps having the buddy system in place. Congratulations sweetie, I am looking forward to making more stories with you this summer. And you, too, buddy. We’ll have some good times! Whee! Yahoo! Would love a piece of that cake. Looks delish. In lieu of cake I consider your writings a treat. Every post – no matter the topic – is beautifully expressed and I always look forward to reading them. You have a gift. Thanks for sharing it. I’m thankful our online paths crossed this year, Pierr – it’s been a pleasure getting to know you and seeing your photographs and appreciation for the creatures around us! My goodness, another year behind us!! Congratulations on this great accomplishment! Once again I will wish for you and Capt’n J…..Calm Sea’s, Fair winds and Full Hooks. Be Safe and Be Well! As you know, that’s the perfect blessing to send fishermen off with! Thanks, Vicky, and best wishes for a lovely summer on the island. Congrats on the first year. Nice work and keep ’em coming. I’m glad you’re here, Karl – I really value having a place that resonates with the younger generation of fishermen, as well as non-fishing friends who enjoy learning about our special lifestyle. Looking forward to seeing you, Julie and family on the dock! Happy Birthday! Say “Hi” to Sitka, the place of my birth, and Beth and Stephen for me. Mel, I didn’t know you were born in Sitka! Do you get back over very often? I haven’t gotten to ride that high-speed ferry yet, but it’s pretty impressive, flying past us in Neva Strait. In addition to being fellow Backdoor regulars, the Nerka is on the same float as Beth and Stephen’s boat. 🙂 I’ll definitely give our neighbors your hellos. I must have found your blog about 3 weeks from your first post. Cool beans. I’d still love an entry about foot care. It’s so difficult to maintain foot hygiene when I’m working 5 hour shifts on the deck, cleaning fish in hot boots. Not many chances to change socks. This is maybe not the sort of topic for Hooked, but I’d love some tips all the same. If you draw my name, please take my winnings to the Amberle. I think Roy will be in his usual spot in a couple of weeks. Thanks for the truth. Good luck this season! Hey Holly! Does that mean you’re coming back for another season on the Amberle? Awesome – I’m looking forward to having you back in the harbor. That is a GREAT idea about foot care. Not sure I have suggestions – Cap’n J is way better at changing socks than I am – but can definitely relate to the struggle. I’ve got it on my list of things to write about now, so maybe we can get some good responses from other readers with helpful tips. Yep, you were an early member of this crowd. Thanks for sticking around and all of the encouragement! Happy Birthday! I’m very glad I stumbled upon your blog and love the window you open into such a different way of life. My tagline is “Everyone has a story” and you are surely proof of that! By the by, you’re also a fine writer. Patricia, it’s been a pleasure having you here, and I absolutely agree with your tagline. What other way to make the world a more compassionate, celebratory place than through our shared stories? Thanks for all of your contributions towards that goal. happy birthday Hooked – now we know each other! Tele, Happy birthday to Hooked. Hard to believe that your baby is one. Love to you, Joel and your next year’s adventures in Alaska. See you on the ocean. I would like to buy a book, please!!!! You’re so sweet, Lori! So good to talk with you the other day; hope everyone is healthy and feeling better, and that you’re enjoying as beautiful of a spring day as we are. Hugs to you and all. 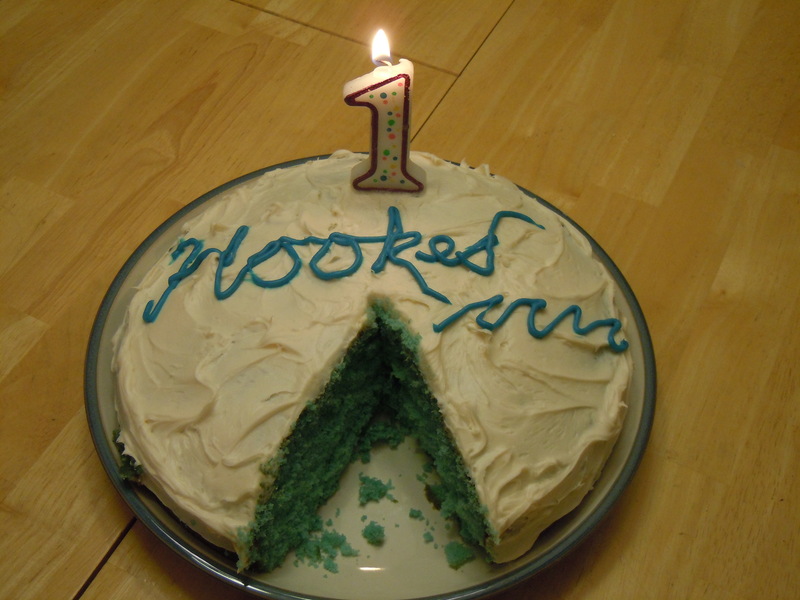 Happy 1st, Hooked! That cake looks great. Bear has some restraint, sitting there with his white whiskers. Suggestions? Keep fishing. Keep writing. You have the sea’s depth, its inclusiveness, its generosity. Kathryn, thank you for bringing Neruda to Hooked, and for your very generous words. Appreciated, friend. Oh, and Bear’s restraint? 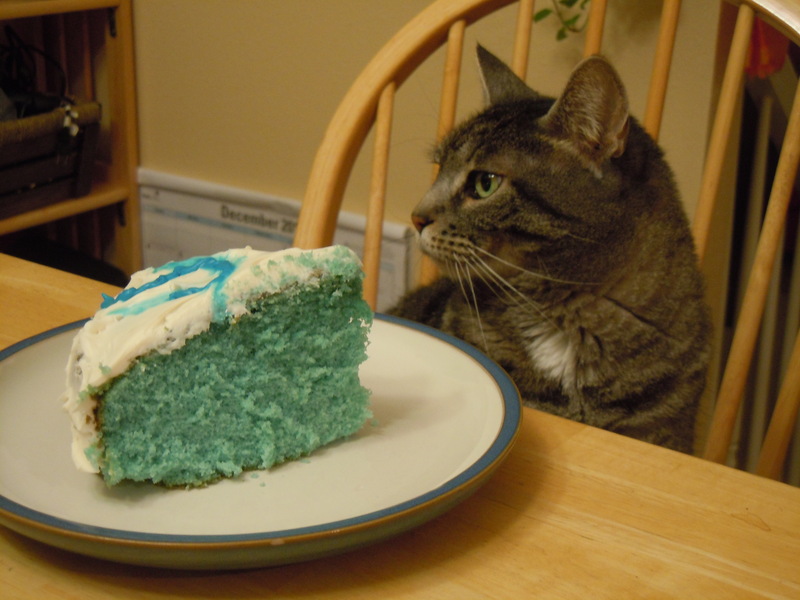 Not so much… A moment later she was on the table, whiskers-deep in frosting. I very nearly posted that picture instead, but had second thoughts. This one definitely shows her better manners! Tele, I await your next adventures…everything to date has been delightful and illuminating for me. Keep up the great words (work). Holly, foot care is a valid topic for many…daughter had issues from wearing boots in desert in Iraq…foot=foundation=important. Good idea. You’re another who’s been here from the beginning, Linda, and I’m thankful for your continual encouragement. Thank you! Good seconding of the foot care – also a HUGE issue from my social work days, kids who’d been wearing the same filthy, wet socks for days in the rainy Pacific NW. New topic on the list, thanks to you and Holly. Congratulations on a great first year!!! I’m so proud of you and your writing. I LOVE Hooked! I also love your commitment to your writing. Here’s to another great year of writing and fishing!!!! Aunt Lynn – what a lovely surprise to hear you chiming in! I didn’t know you were out here with us. If anyone knows a thing or two about commitment to writing, it’s you. Thank you for being an inspiration in practicing your own craft, and encouraging others to do the same. Thank you so much for your blog and for sharing with so many of us your thoughts, your experiences. I savor your words, Tele. Well, I feel the same about yours, friend. Thank you for your kindness, and your insightful, moving reflections. Happy Birthday! I love when you speak for the trees! I’d love to win the book! We’re a good team, then, Jodi, because I love listening (reading) you speaking for wellness. Thanks for all of your service and heart, friend. Happy Birthday, Hooked. Good job, congratulations, bravo!! I comment less because I feel it’s no longer my place, but I do send my congratulations to Cap’n J for his poetry win and my condolences for the bookend boat disasters. And I unabashedly brag on my Alaskan female fisherman deckhand friend. My son, a big strapping guy about your age, said he would love your life. He worked a couple of years as the chef aboard a research vessel out of Florida. C.J., there will ALWAYS be a place for you at Hooked! I remember very well you reaching out in the earliest days, and my delight at learning of our shared trolling history. Every time I passed your brother’s boat on the drag last season, I sent a little smile out to you and Smoke. You’re right, Hooked has indeed been blessed with many new friends over the past year. I’m thrilled that these stories resonate with a wide audience, and am grateful for more people to learn the blessings and struggles of the unique lifestyle that you and I know so well. New voices are valuable additions; it’s up to us to create a culture amongst us that allows Hooked to grow, while retaining the comfort and warmth of a small group of friends sitting around the kitchen table. As the season amps up and I spend weeks away from the internets, I’ll be relying on our regular readers/commenters to help create that space. Thanks for saying hi, C.J. – I’d noticed your absence, and was sending good thoughts your way. Hope you’re having a lovely spring day. I’m a little late to the party today, so I guess all the cake is gone. However, I’m adding my congratulations to the mix. I never would have said to myself, “Hmmm, I think I’ll search for blogs about fishing in Alaska,” but ever since I found you I love learning so much about a different world than mine. And I wonder if the salmon I love to eat is coming from your boat. Save journeys out there. Looking forward to more stories. Even though I am still in Sitka, I find you tie me back into the fishing industry that I was a part of for so many years. Thank you for your voice. Thank YOU – if this is the Greg J I’m thinking of, then whether you’re coming at this from your own deck or the dock, you have been and remain a tremendous contributor to the industry! Thank you for your decades of service to maintaining an industry-wide standard of quality. A new visitor I am, but hooked already. Happy Birthday! I will serve salmon for dinner tonight, in honor of you and all the others who are on their way to another season at sea. Best! What a wonderful honoring – and I don’t have to ask you if it’s wild! I’d love to hear what your favorite salmon recipes are sometime. Meanwhile, best wishes for your own continued writing, Nancy – enjoy yourself and your story! Congratulations on a wonderful first blog year Tele! When I receive the email with a new Hooked post, I save it until I can sit down to read and truly appreciate your writing 🙂 Coming in from the first longline trip of the year now…wish I could share a pic, it’s absolutely stunning out today! What an awesome comment, Amyee – realizing that you were reading/writing from out on the water, your boat hopefully plugged and slogging her way towards town, totally made my day! What a great feeling that is, the first trip under your belt, the conditions smiling upon you, knowing a shower’s in the near future… thanks so much for being part of this community since its early days, and best wishes, Amyee! I would have replied anyway but with the chance to win your blurb, how could I resist? Sorry I didn’t find Hooked until a few months ago when catching up on Fisher Poets info. You, Captain J, and Ashley made quite a splash this year. (Talk about unique perspectives…a cowboy welcoming you to Fisher Poets) I look forward to following you guys this year and entertaining myself with the pleasure of reading your work. You have a gift as a writer that I can only dream of. Keep up the good work! Happy Birthday, Hooked!!!! It’s been great to get to know you through your blog. May you have many happy writing years in the future. It’s a wonderful blog, Tele. Thanks for sharing your beautiful writing with the world. And congratulations on the anniversary! Congrats on the one year anniversary! I’m looking forward to another year… especially more scenes from the Nerka along the coast… my favorite was K’naan drag jam in the westerlies (which blew so much during the summer of 2011). i also liked the recipe for salmon. most especially, i love the mix of perspectives and insights and the complete lack of any orthodoxy in your writings and reflections. keep it up!! !